Earlier this week I said I know where all my stash is. Most of it is on the shelves in the picture of that post. In addition to those shelves, I have a chest of drawers that houses miscellanous stuff, including two drawers full of music fabric. Four or five years ago when I started quilting in earnest, I picked up a couple of music themed FQs. My thought was someday I would make a music quilt for my DH who is an instrumental music educator. He suggested that I cut a single repeat from each fabric and sew it together for the top. 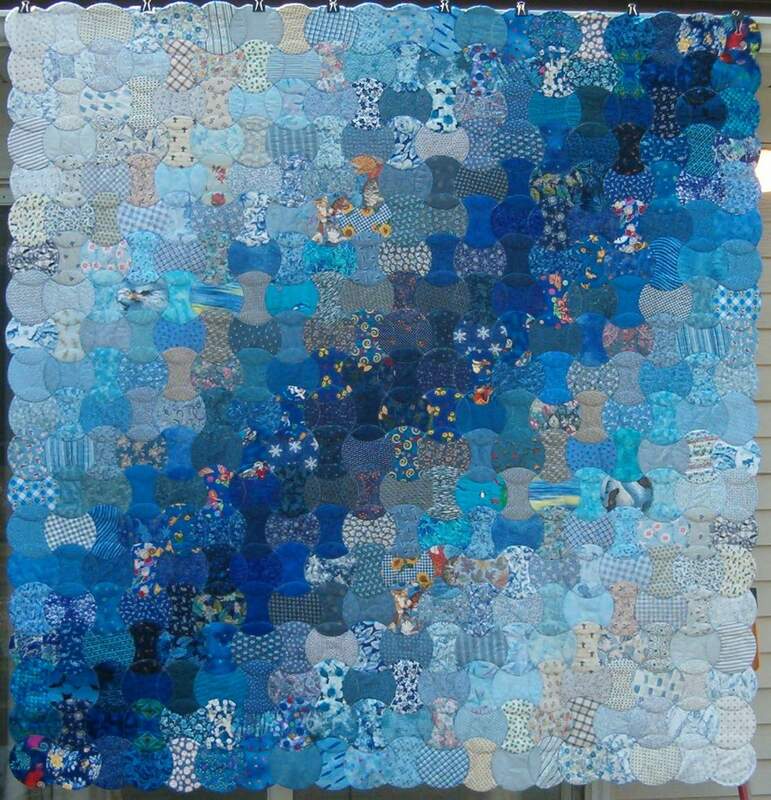 The quilter in me wanted a piecing challenge and dismissed the idea. Besides, I only had a couple of FQs. Now I’ve got 2 drawers full. The some of the blue fabric I raided for the Blue Applecore quilt I made for my DH. So there’s less than a FQ, some pieces are 2 yards. Most are FQs or 1/2 yard pieces. But how much fabric do I NEED for a single quilt. Since I couldn’t fit another piece of fabric into the two drawers, it was time to design a quilt. Now DH’s idea that I dismissed sounded really good, but I had over 150 pieces of fabric, not including repeats bought by mistake. I still wanted to ‘piece’, but didn’t have a clue what I was going to do. On the Quilt in a Day forum (http://www.quiltinaday.com/) someone posted a picture of a floral quilt. She had used 100+ different floral fabrics (5″ or 6″) and then sashed them with pieced sashing which formed a star with the cornerstones. The quilt design was set. That’s when I discovered I needed another 8 music designs. That was another 2 yards of fabric to the stash. I’ve got part of the quilt done. — All the charms are cut — but that’s only 3 1/2 yards. The backing will take another 7 or so (yes, I’ll piece it from the music stash when I get that far.) But my guess is I will still have two drawers full of music fabric when I’m done. This is my first post. I’m not certain of what I’m doing, so please bear with me.